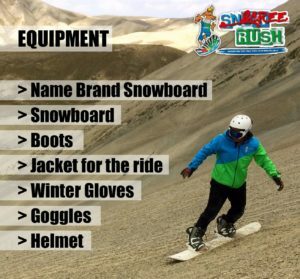 RIDE THE WORLD’S HIGHEST SCREE SLOPES!!! On every trip, we send enough first aid equipment and supplies to perform minor surgery (no…we will leave that to the doctors…but, we have a lot!). Our guides are first-aid and rope rescue trained, and go through regular reviews of their training. Our guides use international guiding standards and receive vigorous training, to ensure that the instruction and guidance they give will keep you comfortable and confident as you grow in the sport. Our guide has international certification and licenses as a ski and snowboard instructor from Europe. Our guide has worked in 5 countries coaching and training for over 10 years. We use only name brand top-of-the-line equipment which is regularly serviced by professionals. English speaking guides have a ton of experience and training, and a ton of fun! We love to ride, which is exactly why we do what we do!